A medical advance that could have as large an impact on disease eradication and life extension as penicillin is regenerative medicine and tissue engineering. The field was perceived as revolutionary even a few years ago, but rapid advances have made it seem almost commonplace today. Replacement organs grown from one’s own cells are desirable since this would avoid immune system rejection and a lifetime of immunosuppressive drugs and their side effects. Hollow organs like the bladder are easier to create than the more solid liver and kidney, and the heart is the most challenging. The current status is that several dozens of lab-generated bladders have been implanted in humans. In the case of other organs, the present focus of tissue engineering is on conduits (e.g. ; providing a link to the outside of the body for waste removal (Tengion neo-urinary conduit clinical trials)) and augments (e.g. ; providing a supplemental path for normal operations (Tengion neo-kidney augment and other augments)). Vascularization, or blood-vessel printing, is an intense area of research focus, and there is some promising progress from at least two sources, well-known regenerative medicine research leader Anthony Atala, and tissue engineering startup darling Organovo. This could be a key step in allowing more sophisticated organs to be regenerated. Computer software and the internet have long been cognitive enhancement tools. Spellchecker obviated the need for spelling skills. Wikipedia and the internet obviated the need for fact memorization. There is less reason to earn a PhD if the module might be available as a cognitive plug-in within a few years. 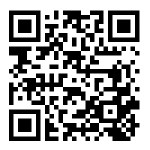 The need to speak foreign languages is reduced with Google Translate for Android. Social networks like Facebook are acting as a social prosthetic. It is now possible to have a massively larger context-driven social apparatus with deep-interest specificity. Accessing, assimilating, applying, and interacting around knowledge and information has become the critical 21c skill set. DIYgenomics released a personal genome Android app update on January 9, 2011 adding three new elements of functionality: the ability to upload and store 23andMe data in the app, multiple views for health risk, drug response, and athletic performance (Figure 1), and a quality ranking system for each SNP. 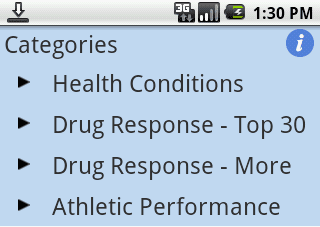 Figure 1: DIYgenomics Android mobile app view categories. 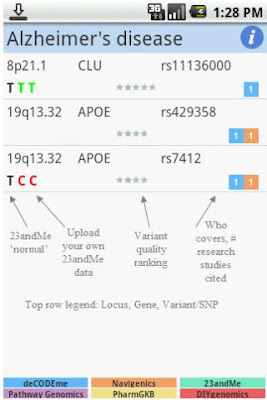 Selecting any item displays a list of variants or SNPs (places of potential genetic typos), such as for Alzheimer's disease (Figure 2). 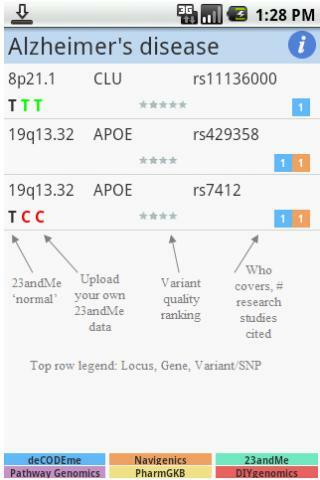 The locus, gene and variant (SNP) details are shown, along with the normal type (e.g. ; no mutation) for 23andMe data (if it exists) in black, an individual's 23andMe data (if loaded) with normal alleles in green and mutations (polymorphisms) in red. Stars (from 1-5) indicate the research quality of the SNP (per the journal ranking of the study, the number of cases and controls, etc.). The colored blocks show which service providers cite the SNP (per color legend), and how many studies they cite. Figure 2: DIYgenomics health condition Alzheimer's disease. In Health Conditions, a mutation (polymorphism) presented in red generally indicated being at higher potential risk for developing a condition. In Drug Response, a mutation could mean that the normal dose of the drug may not work as well, that there could be side effects, or that there could be a higher change of addiction (for substances). In Athletic Performance, the favorable mutation (green), suggests greater than average athletic capability. A group of interested citizen scientists came together to explore how they could make their 23andMe personal genomic data actionable. A small (n=7) non-statistically significant pilot study was conducted looking at polymorphisms (e.g. ; typos) in SNPs in the MTHFR gene and their connection to Vitamin B deficiency and high (undesirable) homocysteine levels. Four out of seven participants, though healthy, had high baseline homocysteine levels. For five of the study participants, a regular drugstore multivitamin worked best for reducing homocysteine levels. Overall, homocysteine levels were reduced 19%, commensurate with 23% reductions achieved in traditional clinical trials. This is an important example for two reasons: the preventive medicine model and the crowdsourced research model. This study illustrates one approach to the challenge of preventive medicine. Prospective tracking of genomic data + phenotypic data + interventions could help to establish baseline measures of wellness in large populations, shift health management responsibility to individuals, and potentially prevent or delay the clinical onset of conditions. This study shows the value of crowdsourcing citizen scientists for research studies as they increasingly have access to their health information, may be willing to contribute their data to various studies, and have the interest and motivation to investigate conditions of personal relevance. 2. Device proliferation continues; tablets, e-book readers, etc.